Ever since I reached my mid-20’s, or at least, ever since I started experiencing the so-called “quarter-life crisis”, I started categorizing some of the books I read into a “QLC” category. This list includes Astigirl by Tweet Sering, and Cold Tangerines by Shauna Niequist, both of which are non-fiction. 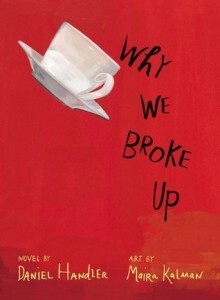 After reading Mina V. Esguerra’s Welcome to Envy Park, I finally had a fiction book in that QLC books list. Moira Vasquez is on a break, and she’s taking this break in her brand new condo in NV Park after five years of working and saving in Singapore. And this break it meant: no job, no boyfriend, but with some plans on where she’s jetting off next. She has no plans of staying too long, really, even if Ethan, the cute guy who lives in the same building is proving to be a really good distraction. Moira is convinced that she’s home for a quick stopover, but what if what she needs is already right in front of her? Welcome to Envy Park didn’t feel like the usual contemporary romance that I’ve known Mina for. Somehow, this book feels a little bit more mature and perhaps it’s because the romance felt like a side story to what Moira was going through. I admit that I’m not a Moira. I’m not the type of person who’d shake things up just because (until lately, anyway). I tend to become comfortable, and just settle there until the restlessness finally hits me and I drag myself up. I never thought of working abroad, and until now I still don’t think about it, but I do admire Moira for her guts to do it, and to keep on doing it. It takes a certain kind of personality, I guess, to be willing to uproot yourself every time. But you can’t always uproot yourself, right? At some point in your life, you have to start thinking of settling down (I got that feeling when I turned 27. Then things happened, and now I felt the need to uproot myself again, heh), and this is basically Moira’s story. I liked how Moira was exposed to so many people in the book and how she observed them, and how she compared her life to them with her lists. Her voice is fun and fresh and her struggles with her thoughts, her career, her family and her love life felt true, like it’s something someone her age experiences. The story flowed easily, although it may not be as gripping as other romance novellas are — perhaps it’s because again, it really didn’t feel like one for me. I thought it was more about self-discovery, and yeah, a certain kind of coming of age, and romance just happened to come with it all. And isn’t that how it really often happens in real life? I swear, he just lets things happen, like he’s a leaf in the wind. I don’t rock the boat if it’s not worth rocking just yet. As opposed to what, declaring to the universe things that haven’t happened yet? Maybe I needed to place a tiny portion of my happiness in someone else’s hands, and not completely control it. So another year ends, and time for some numbers! How was my 2013 in terms of reading? Well, 2013 is definitely lower than 2012, or 2011, I have to say. Life was a little bit busier this year, and again, I seem to have started reading a lot slower now (except maybe for the past few days, but that’s because I’m on vacation). I don’t really mind, because I think I’ve gone past the point that I need to read, read, read so many books in a year just to feel accomplished. I liked that I hardly had low-rated books this year, though — I guess it means I’m learning to choose only the books I would surely like…or I’m just lucky that I read the books I ended up liking. I read a lot ebooks this year, much thanks to Hannah the Kindle. However, that meant my print TBR pile didn’t budge, and I want to tackle that next year. I love my Kindle, but I do miss reading print books, feeling paper and yeah, dog-earing them, too. I was shopping for a Christmas present for my mom in Body Shop when I saw that they have new stocks of my favorite body butter scent, tangerine. That scent became my favorite by accident years ago, when I went there to claim my Love Your Body membership birthday gift, and they gave me a small bottle of their tangerine-scented lotion and body wash. I used it for the gym and loved it, and eventually bought more until I got broke and realized that my daily bath stuff are too expensive. So while I was there, buying a Christmas present for my mom, I decided to get a tub of the tangerine body butter, since it’s on sale anyway. Plus, the scent just really cheers me up. I’d like to believe that the moment I had with that body butter was something that Shauna Niequist was pointing at in her first book, Cold Tangerines. The subtitle alone is an indication of it: Celebrating the extraordinary nature of everyday life. Plus the fact that what I bought was a tangerine scented body butter, it kinda fits the entire thing, right? Anyway. I loved the first Shauna Niequist book I read, Bittersweet: Thoughts on Change, Grace, and Learning the Hard Way, so when I saw that her two other books were on sale on Kindle on early December morning, I immediately bought it. I was a little afraid that her books might be those one-hit thing, meaning I won’t really like the others I read because I won’t be able to relate to it, but I shouldn’t have feared anything with her first book because it was exactly what Bittersweet was for me when I first read it: it came at the right time in my life. Cold Tangerines is exactly about what it says: celebrating the extraordinary nature of everyday life. Here, Shauna Niequist talks about the many little ways that God shows Himself in life, how the natural becomes spiritual, and how the physical things we see and we do are all connected to how we are nourished spiritually. There’s food, friendship, writing, traveling. There’s body issues, vacations, heartbreak, family. Shauna shared stories of her personal life, much like how she also did in Bittersweet, and then points the reader to God, and His faithfulness and His wonder in the ordinary life that she had. Which means, we too, can see this, the extraordinary in our everyday life. I loved how easy it was to relate to her stories in this book, and whatever stage of life I was in, I would be able to find wisdom and advice in this book. Shauna’s honesty shone in this book, and when I read the part about how hard it was for her to write in this book, I realized how much she must have struggled to put these words on paper. But that struggle was a blessing, at least for me, because I know that struggle, too. I feel that every time I write a post for my personal blog, wrestling with the words in hopes of them being used for something. And then there’s the forgiveness chapter, one of my favorites, which really and truly came at the right time because I was struggling to forgive and ask for forgiveness from someone as well. Like Bittersweet, I think I highlighted almost half of the book — there were just so many quotes to keep — the ones I added below are just a glimpse of it, really. I don’t plan on using my tangerine-scented body butter everyday because I don’t want to run out of it too fast. But I do take the time to smell it everyday, in a way to remind me that I can choose to see my life as sweet and happy, because it really is. 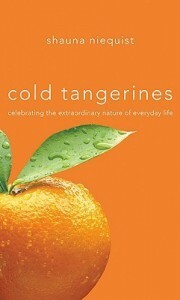 And that is what Shauna Niequist’s Cold Tangerines is — a reminder that there is something super in our natural life. Cold Tangerines is the kind of book I would recommend someone to read especially for the New Year. It’s fresh and honest and funny and inspiring, and I think it would help set the mood for the fresh start that everyone’s looking for in the turn of the year. Or if it’s not the New Year, read this, still. 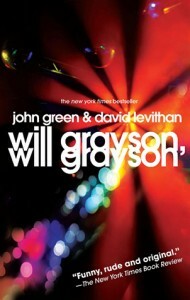 This book is a reminder that there is beauty and hope and redemption in this extraordinary everyday life. God is no match for the wreckage of the world we live in. The big moments are the daily, tiny moments of courage and forgiveness and hope that we grab on to and extend to one another. Friendship is about risk. Love is about risk. If we can control it and manage it and manufacture it, then it’s something else, but if it’s really love, really friendship, it’s a little scary around the edges. I felt so small and anonymous, surrounded by the sounds and smells and sights of a place I’d only read about, and I could go as quickly or as slowly as I wanted to. 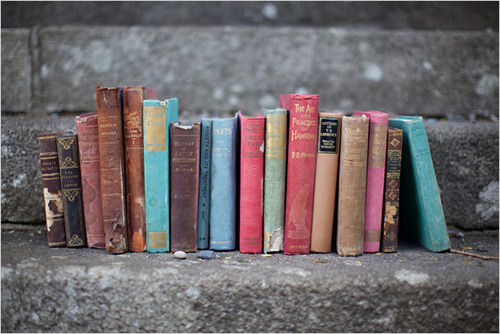 There are only two things I like to do alone: reading and traveling, and for the same reason. When you travel, and when you read, you are not actually alone, but rather surrounded by other worlds entirely, the footsteps and phrases of whole other lives keeping you company as you go. Help us to be brave with one another, for these are the days. Words are the breakdown through which I see all of life, instead of molecules or notes or chords and colors. words in even black and white snakes, back and forth across the page, the portals through which a little girl found a big world, and through which, now, a grown-up girl is trying to pass. I have never been so clingy and strange, so unmoored and lacking in appropriate small talk, and I am beyond thankful to my friends for sticking around in the worst of it. When I pray, something freaked-out and dazed inside me finds a place to lay down and rest. When I pray, I don’t feel so alone in the universe. I feel like there is a web, a finely-spun net, holding it all together, keeping it spinning. I feel powerless, and prayer reminds me that I may be powerless, but there is power, and the one who holds the power is good. It was like a full-time job, forgiving her over and over, with each new angry thought or bad conversation, but it was good work, like how good it feels to shovel snow or rake leaves in the cold air. It happens when we do the hardest work, the most secret struggle, the most demanding truth telling. In those moments of ferocity and fight, peace is born. Shalom arrives, and everything is new. And when you’ve tasted it, smelled it, fought for it, labored it into life, you’ll give your soul to get a little more, and it is always worth it. Nothing good ever comes easily. You have to lose things you thought you loved, give up the things you thought you needed. You have to get over yourself, beyond your past, out from under the weight of your future. The good stuff never comes when things are easy. The sacred mixes in with the daily when you have a conversation with someone you love, or you read a great book, or when you do something courageous.